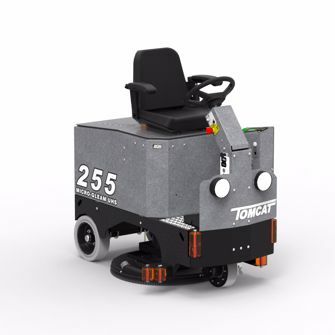 Tomcat’s battery-powered 255 rider burnisher is designed to operate quietly while preventing dust from spreading which is great for schools, hospitals, malls, museums, airports, and grocery/retail facilities. Its commercial construction, size and performance make it a great choice to polish floors. The 255 is smaller than most walk-behinds and has a 35% wider path. It can make even the oldest concrete shine like a mirror – fume free – with its 4 hour run time! Did you know you can save money on your electric bill because highly polished floors reflect light more evenly? You’ll spend even less money because you won’t have to refinish, recoat and machine scrub. Most importantly, dust control comes as a standard feature so there is no need to mop the floor after buffing. The pad pressure on the 255 rider is variable and combined with the driver and floating head design, it delivers a stunning finish on even or uneven floors. The head on the Tomcat 255 is fully floating and balanced to provide a long lasting finish to uneven flooring. The burnishing deck is completely protected underneath the machine but is easily accessed by tipping back the machine. Preventative maintenance is a breeze with the built-in hour meter and deluxe instrument cluster. The optional onboard charger allows operators to burnish a large area and recharge at any wall outlet. DImensions (LxWxH): 54.5" x 25" x 50"